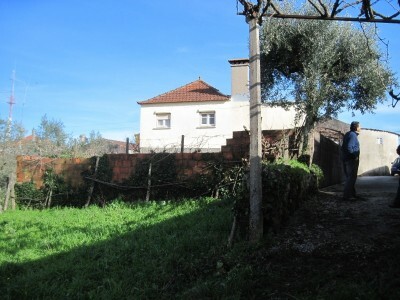 A two bedroom stone house with annex for sale near to Pedrógão Grande in central Portugal. The cottage, which is set over two floors, is connected to both mains water and electricity and is in a rural location though is easy to access and close to amenities. The house has been constructed in stone and then later rendered. The windows have wooden frames in good state of repair. The property measures 180 square metres of construction and has land measuring 713 square metres. In addition to the main house, there is a small stone cottage used to store garden equipment, measuring 22,5 square meters, which could be converted into a garage. There is a walled courtyard in front of the cottage with metal access gate providing a nice outdoor terrace. The ground floor of the house has been traditionally used for storage purposes and wine cellar, and has three self contained rooms each with their own access doors. The largest of these rooms has been used as the “adega” and consists of two parts: a front, more modern part and a back, older part. In the older part it still has three wooden wine barrels in good condition in situ. This back part of the adega has rendered stone walls and a wooden ceiling, though could easily be converted into additional living space if required. It is located beneath the room on the first floor which has not been modernized when the rest of the house was renovated some years ago. The front part of the adega has a tiled floor and totally tiled walls and concrete ceiling. There is a metal stove and a traditional wooden kitchen cupboard on one side and the entrance to the older part of the adega on the other. The second room has been converted into a summer kitchen. The kitchen has rendered and painted walls, a concrete ceiling, totally tiled walls and floor, and a metal framed window to the side of the house facing the neighboring garden. There is a sink and a large gas stove as well as a number of base and eye level units. There is also a large fridge-freezer combination and a large deep-freeze box and a TV. There is enough space in the kitchen for at least a table and four chairs. Due to the fact that the entrance to the kitchen is set back into the older part of the house, there is covered space in front of the kitchen large enough for a table and at least four chairs. The third room on the ground level is being used a storage for fire wood. It has exposed stone walls and a concrete, not rendered ceiling. This room could easily be converted into more living space. There is, also on the ground floor and more precisely below the bathroom, a large water tank which holds water pumped up from the borehole, which is used to water the garden behind the patio. The first floor accommodation is accessed via an exterior stone staircase at the front of the cottage. The main entrance leads directly into a corridor with a window looking out into the courtyard and a tiled floor, which can also be used as a dining area, since the kitchen is right next to it. The kitchen, which also has a tiled floor and partially tiled walls, has a traditional fireplace to the rear. There two base units with drawers, one of which has a sink, and a granite work surface above which there is a gas boiler to heat the water for the kitchen as well as for the bathroom. The bathroom, which is accessed through the kitchen, is fully tiled and has a toilet and bidet, a pedestal sink and a shower cubicle. It also has a window to the side of the house. The living room is accessed off the kitchen and is also double aspect. The living room has a tiled floor and wooden ceiling and a window to the side of the house. Off the living room there are two small bedrooms, both of which have wooden floors and ceilings. There is still another door from the corridor, leading into the older part of the house above the adega, which has not been renovated since the house was first constructed. This used to be the old kitchen and there is direct access to the roof of the house. The roof, which is in pretty good condition, has wooden beams and traditional roof tiles. This part of the house has a wooden floor and wooden interior walls and could easily be converted into more living space. To the back of the property there is a garden with about 700 square meters of land, with several fruit trees and old olive trees as well as many old grape vines. The plot is level and easy to work and maintain. There is also an old stone shed which could be converted into a garage. The property has nice views into the surroundings, which consist of gardens and hills with forest. The property is located within a small hamlet, about three kilometres of the Cabril dam and the beginning of the Castelo do Bode lake. The property is situated in a rural location though is only six kilometres from the small town of Pedrógão Grande, which has several cafes, restaurant, mini-market, health centre and schools. The beaches near the town of Figueira da Foz on the coast are only one and a half hours by car. The property is easy to access and is four kilometres from the IC8 dual carriageway. The closest airport to the property is located at Porto, which is around two and a quarter hours by car. Porto airport is serviced by a variety of low cost airlines, which operate regular flights into and out of the United Kingdom and other European countries.